Once the news spread that Indonesian patient’s family member would demonstrate and explain how to cook Indonesian main course at half past ten September 15, soon the pubic kitchen of 7th floor in Modern Cancer Hospital Guangzhou was surrounding by many waiting people including patients, patients’ family members, nutritionist and reporter of hospital. 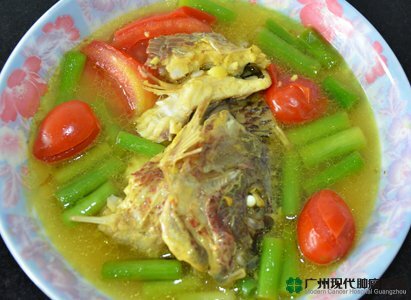 It was said that the famous Indonesian dish yellow croaker soup (Indonesian named pindang kuing) is one of most popular dishes in Indonesian meal. Would this dish, which would be made by the chief from Indonesian, be especially delicious and send off inviting fragrance? People here were full of expectancy. At half past ten, head cook Anane and his assistants (family members and interpreter of this hospital) started to make this yellow croaker soup. The main ingredient was the tropical fish tilapia (tilapia) with tasty and tender meat and it was diced into medium size first. And then, under the guide of Anane, assistants began to prepare mixed ingredients: lemon, turmeric, pineapple, red onion, garlic, garlic stems, big and small tomatoes, ginger, chopped onions. Various condiments were meticulous collocation. When the preparation completed, Anane began to demonstrate his real skill. Put garlic, ginger and onion into a pan with oil and fried them till there was fragrance, added two big blocks pineapples after two minutes and continued to stir-fry, added some water into it and stew them for 3minutes, then the mixed ingredients were done. On other hand, prepared a big stew pot and added water, when water was a little hot, put the already made mixed ingredients; when water was boiled added the fish blocks, tomatoes, garlic stems and salt one after the other. 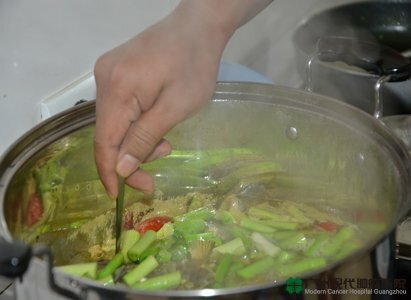 After stewing for 15 minutes, the dish pindang kuing was finished: white color of soup with taste of sweet and sour, tender and fresh fish meat, delicious and crisp fish bone and colorful mixed ingredients; all of these made this dish perfect combination of color, aroma taste and appearance. During cooking, all the people were deeply attracted by the thick aroma and unable to bear, as soon as the dish was finished, they couldn’t help tasting it. Patients in the same floor heard the dish was finished, they brought their eating tools to have a taste and even some of them pack it as lunch. During cooking, Anane told the nutritionist of nursing department and the cook the key points: use freshwater fish and mixed ingredients as mentioned above instead of Chinese common used ingredients such as soy sauce, tomato sauce and mature vinegar: use yellow ginger for mixing color, the fresh tomato instead of sweat and sour sauce, pineapple instead of mature vinegar and so on. The nutritionist wrote down all the points at the same time. As nutritionist introduced, nursing department and cooks of this hospital devoted themselves at nursing patients’ physical condition through diet and tried their best to allow patients absorb more nutrition. They though a lot all the time about patients’ diet and made out reasonable and nutrient plan of everyday. Regarding the big different eating habits between overseas patient and Chinese, cooks always learned new dishes which would meet patients’ eating habit through various ways. Consequently, they initiated the idea that learned cooking from patients’ family members, and so there was such a funny culinary exchange program.